We aren't gunna study war no more! How Much Can It Cost? Bryan and Joseph at the beach. 4 July – great composite pic. From Pine Gap to Rockhampton, via Waihopai. I’m Glad I Did It! C-m 22 July Tigers Good to Go! The occasion of Margaret’s recent court hearing was a whirlwind of action and directed thinking. I watched in awe as Margaret organised material, evaluated evidence, invited network participation, and considered a range of responses and arguments. Then she had a go. 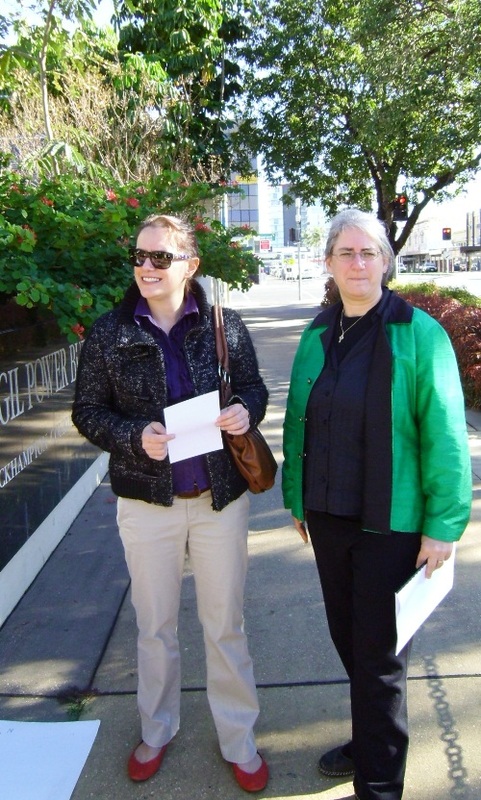 Margaret and her "McKenzie friend" Kate outside the court-house, ready for business. We made a road-trip to Rockhampton for Margaret’s day in Court. We caught up with a handful of Rocky locals. The Court hearing triggered a range of stories across local media, and most of the journalists were switched on to Margaret’s view of this charge as an act of harassment. Margaret and supporters make a little show before court. The highlight of the hearing was testimony by press photographer Chris Ison. Chris is the senior photographer with the Rockhampton Morning Bulletin. Margaret asked him if he regularly took photographs of “defence installations” as part of his work, and if he took those photographs without ADF permission. The prosecutor leapt to his feet and asked the Magistrate to warn Mr Ison that he might incriminate himself in his answer, and was under no obligation to do so. Chris Ison is a pretty straight arrow, and confident of his own skills and values. He responded that he was happy to answer the questions. He said that he believed he had a right to take news photos. If such photos included defence installation, so be it. He strongly believed he was within his right, and saw no reason for apology or fear. And there it was. 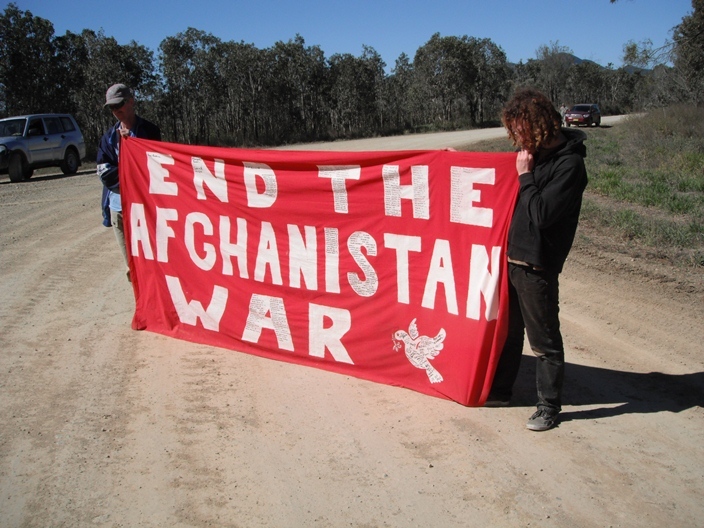 Behaviour which is acceptable to the ADF when carried out by a press photographer is not acceptable when carried out by a peace activist. Even the prosecutor ran out of questions after confirming there was no permission for two particular photos that otherwise breached s82 of the Defence Act. The Magistrate was moved to ask his own question: “Mr Ison, have you ever been invited onto ADF land before by the ADF to take photos?” “Yes”. The Magistrate and Prosecutor colluded to use this answer to exculpate Mr Ison from criminal liability – using the exact same arguments they refused to allow for Margaret. The Magistrate convicted Margaret. The road in the photographs was a field-work within the definition of s82. Margaret was trespassing on the facility without authorisation. While the camera may have been taken onto the land for other reasons (shrine, recording blockades) there is a technical definition of “intent” for this charge – including that if the offending behaviour is a logical and foreseeable outcome of the conduct engaged in. Photograph a blockade… photograph a road. Done. “Chris Ison is an entirely different matter”. According to the Magistrate, Mr Ison might have considered that any earlier invitation to attend and take photos to be an open and permanent invitation to do the same thing, and therefore he had a defence of implied authority. And Margaret didn’t (even though she claimed she did) because…. Well, just because. The maximum fine was imposed ($100) and costs ($4,886). The Crown kept the camera and memory card ($130). Margaret’s kind of disappointed in that outcome. The costs hurt. They’re meant to. Margaret’s tenacity reveals the spirit at work. Margaret first came to TS09 at my encouragement. While there she joined in with Jessica Morrison, Simon Moyle, and Jarrod McKenna as the Bonhoeffer 4 (which built on Jessica and Simon’s trespass initiative of TS07). Margaret came away from that experience deeply affected by the events that unfolded during the trespass. The Spirit moved. Joining in prayer with a US Marine, remembering the dead in wilderness, stayed with Margaret. 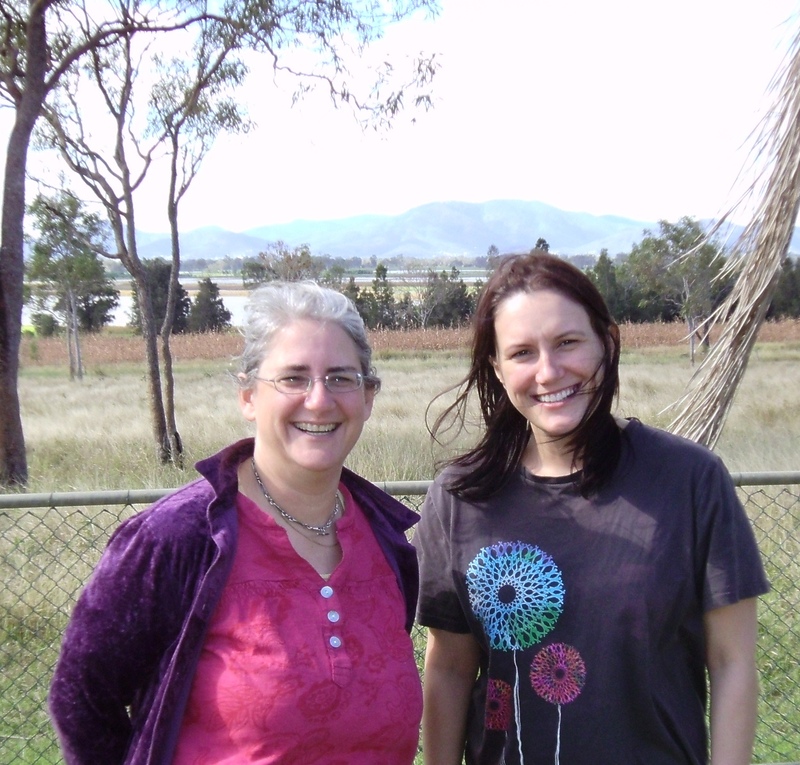 It slowly became part of the Shoalwater Wilderness Pilgrimage which Margaret advocated for, and eventually got to taste in 2011. Margaret got a small but nourishing piece of the high-minded, spiritual and reflective action she envisaged. 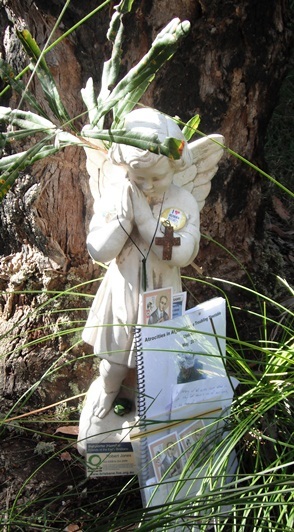 A shrine to the blessed Franz Jaegerstaetter, established on 20 June 2011 in the Shoalwater bay military training area. The bogus ADF complaint gave Margaret the chance to show herself and the pilgrimage project in more detail to the powers and interested parties in Rockhampton. Chris and Cameron from the Dead Fish Society (East St Have-a-chat) paid attention. Jim Dowling and Greg from the Catholic Worker house in Brisbane came up in support. The shrine to Franz Jaegerstaetter got a little time in the sun. 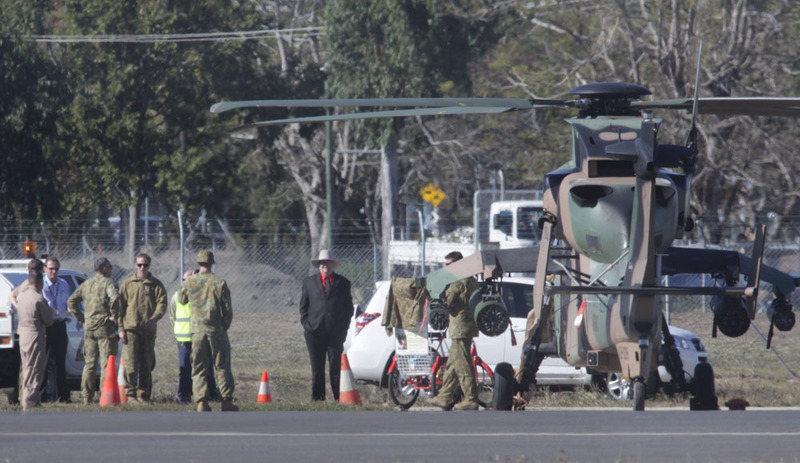 What was revealed for all to see is the benevolence of Margaret’s intentions, and the petty minded vindictive nature of ADF command….. the way police and justice system serve base purpose so readily. The beak had to warn a respected journalist…. and convict a good-hearted woman. Truth was on show. Principled action builds our knowledge, skill and capacity. It makes my heart sing to see Margaret get her teeth into the justice system, and build her skills in Court. There’s a respected tradition of pleading guilty to civil disobedience actions. The Court is then used as an opportunity to explain the circumstances behind the action, the evil which needs exposing, and to invite an appropriate response from the Magistrate or Judge as citizen. This can be politically effective as well as personally empowering for activists. A second tradition is to get in front of a higher court and try to make a “justification” defence. Ploughshares actions regularly travel this path, and there are a handful of acquittals to show for it. It costs more, and can also be effective. A third reason to be in Court is to defend the legal and political rights which shelter the processes of dissent and negotiation through which we act. That’s what Margaret was chiefly up to here, and she learned a lot. It’s a shame the verdict went against her. During TS11 the Police were defeated twice in Court over Peaceful Assembly issues, and the Rockhampton Regional Council was corrected re political discrimination. It would have been nice to set some boundaries for the ADF. Every action campaign faces a variety of legal assaults and constraints. It’s in all our interests to build skills for court advocacy and self-defence. For what it’s worth, Margaret noticed during her preparation that a lot of the legal skill and talent available to activists in regional Queensland is not sufficiently equipped to stage a full and proper defence. Friends who are lawyers working in legal aid or community advocacy don’t generally get to run spirited criminal defences. A lot of their work involves pleading guilty and negotiating sentence. Over worked. Under resourced. Which makes me even more grateful to Margaret for putting herself on the line. Margaret loves to be loved. She would have loved a court system that paid attention to the why of “no more war”, and could uphold the standards of behaviour required by a just society. Did someone say "Rocky's a beaut!"? Instead she endured myopia, technical quibbles, and a prosecutorial/judicial team that rewarded officialdom. It’s a war system after all….. until it’s changed. I really like the photo of Margaret and her pal Kate. Kate’s a dinkum local, and the back-drop is Paradise Lagoon, an icon to the local beef industry. Well written analysis of Margaret’s recent trial. I think she did a great job. Pity about the system. Next Next post: A Brisbane gathering? 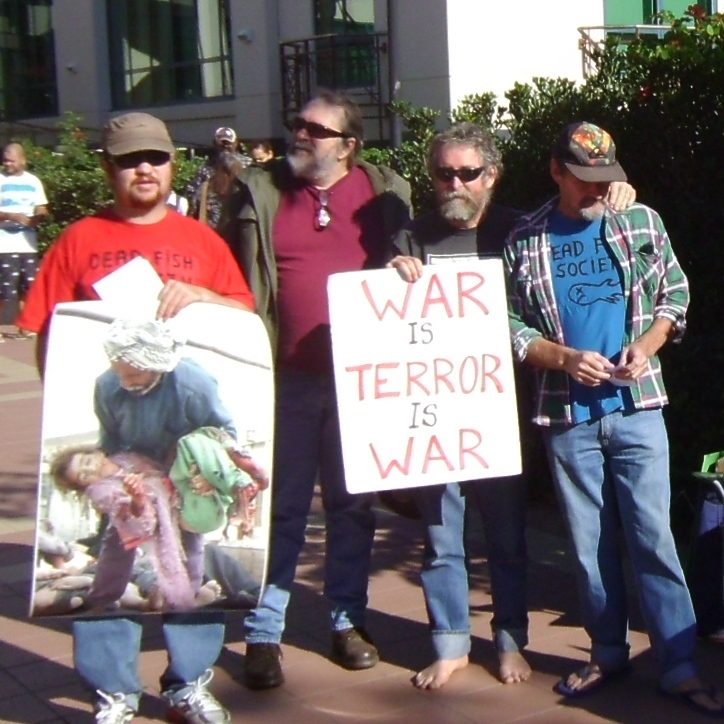 Peace by peace is a Cairns based organisation committed to world peace – a big job best-done peace by peace.